Over the last week or so Chaosium has been pumping up its selection at RPGNow. 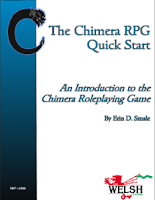 From what I can tell, if it's offered at Chaosium's site, its offered at RPGNow too. This means that a lot of the classic Call of Cthulhu adventures are now available. The shame is, except for possibly around Halloween, I have virtually no chance of running this stuff with my extremely hard to corral group. What I find really interesting is that they are offering the Basic Roleplay Monographs. These are like small print run settings or adventures, such as Agents of the Crown (Victorian) and Aces High (Western). If you are a Basic Roleplay gamer, you options are increased exponentially. 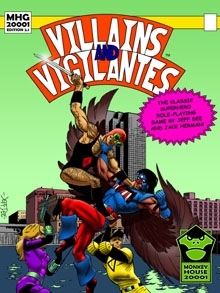 I'm sure you've already heard the Villains and Vigilantes has been redited and reformated with new artwork from co-creator Jeff Dee. Strange thing is, V&V missed me in its first incarnation. Not that I didn't know about it. My gaming group back in the 80s was always torn between V&V and its random chart charactrer generation, and Champions' "lets set a session or two aside to create some heros... point based... advantages... disadvanages... tweaking...mixing... arghh". The few times we decided to try a Supers game, we defaulted to Champions. I think we ran one session of gaming amidst all the sessions of character gen. So sad. Paladin from the iTabletop Pandoren Virtual Table Top has released a video newsletter giving an update on developement and a honest pitch to sign up new lifetime members for the service for 25 bucks. I have a minor quible, and that is the insinuation that the other paid to play VTTs charge for upgrades / updates to the software. I can only speak for Fantasy Grounds, Klooge and Battlegrounds RPG, but I've never been charged for an update to the software from any of these companies. That being said, the video is a fine demo of the video quality of the iTabletop Pandoren software. I think Paladin would have been better served if he devoted a minute or two to the actual use of the software in play, especially as the video link was sent out to over 3,000 members of the forums, many of whom signed up and rarely (I suspect), if ever, returned. Such is the nature of the internet. To see iTabletop Pandoren in action, go here and try the video links. (Paladin, if you are reading this... the site upgrade looks awesome). Do you generally roll sucky rolls when creating your Old School PC? Forced to play with those poor rolls in order rolled? Then this may be the class for you. 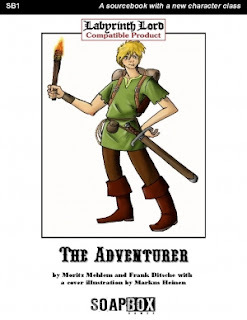 The Adventurer from Soap Box games gives you the class to play when you CAN'T roll above a 12 in any ability you might need in combat. It's the ultimate in the "everyman" situation. Actually, it isnt a bad class.. its a good class for bad rolls. 75 cents for this short PDF. As an aside, it would make a pretty good class for a Watchman type character. Second aside, I answered Greg here. I'm currently thumbing thru Villains & Vigilantes re-release, the Judges Guild Initial Guidelines book, Dark Heresy - Dead Stars, some Labyrinth Lord stuff, a pile of Chaosium releases, some indie game stuff... if anyone has a preference give a shout out below and I'll get to it. Otherwise, I slog thru as I slog thru. If you read this blog and your not a Google Connect Friend... what are you waiting for? 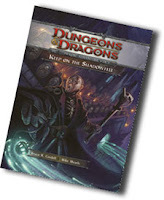 Giving out free PDFs courtesy of RPGNow to a random Google Connect Friend when we hit 40, 50 and 60 Friends. Alright, officially off from work for five days. Time to get reading. Kobold Magazine from Wolfgang Baur is probably the best, all around, regularly produced gaming products around. You can't go wrong with picking up an issue no matter what version of D&D or it's clones that you play. Wolfgang also puts out a series of GM/DM advice books. If you want to improve your game, there is something in one of these volumes that will help you. 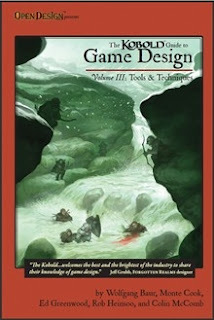 The latest in the series is The Kobold Guide to Game Design, Volume III, Tools and Techniques. First things first: This product is extensively hyperlinked. After flipping thru TKGTPD3 (phew) for a few minutes via the hyperlinks, you'll wonder why most gaming PDFs don't follow suit. It really adds to the experience. In my opinion, the article most useful to DMs of OSR styled game is the one dealing with sandbox style games. Titled - Buckets in the Sandbox: Non-Linear and Event-Driven Design by Wolfgang Baur, it shows how a sandbox setting can have both order and freedom. I've always though of a sandbox campaign as barely ordered chaos. Now I have other options. Well written and thought out, it's given me some ideas to think about as I plan for my next game. All of the articles deal with different angles of adventure design and / or game design. Want to get a head start on designing your own combat system? Colin McComb has some thoughts. Need to work on your plot? Ed Greenwood has you covered. The list goes on... its a whose who of game designers. As for me, I think I'll be stealing... borrowing the most... from Wolfgang's sandbox. Repeatedly. 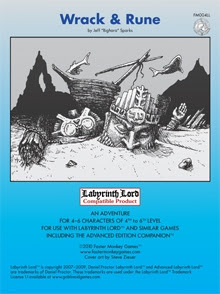 Wrack and Rune for Labyrinth Lord was just released. I haven't done more then give it a virtual thumb thru, but what I've seen looks nicely done. It's on sale at 20% off thru July 4th. The Blurb: It's a typical job: Go get the thing, bring it to the wizard. Of course, you should keep a few details in mind... like the thing is a three-ton statue... probably broken in pieces... and sunk to the bottom of Eel Bight, a dangerous bay haunted by thick fogs, Reef Devils, and a magic island full of kidnapping fairy-folk. Oh, and this wizard is in a hurry, so the reward drops every day. Other than that, no problem! Actually all of Faster Monkey Games' products are on sale thru July 4th. See? Way too much in my review slush pile to get thru quickly. A few days off from work will do wonders. When people think of Big Boys and Their Toys, guns, power tools and monster trucks come to mind. Earlier tonight I got to play with the first for a few hours. I don't do monster trucks. I rarely do the power tools. My main toys are the Roleplaying games I get to read and / or play. That is what I want to do on my vacation. Read all my new toys. Delayed by half a day as I need to run into work in the morning. Best laid plans and all that. Stepping away briefly from our PDF discussions here and here and even here, we come to our latest collection of quick starts. 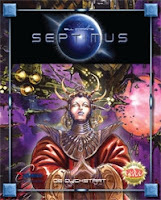 Septimus Quick Start - Or just get the full version for free here. Dungeons & Dragons 4e Quick Start - The most popular game in the RPG world. Easy way to see if 4e fits your play style. 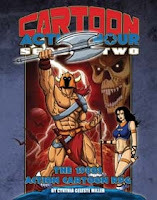 Cartoon Action Hour: Season 2 Playset (FREE demo version) Maybe I can play the D&D Cartoon with these rules. Heh. 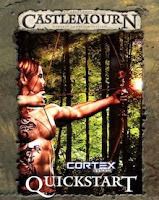 Castlemourn Cortex Quickstart - A setting by Ed Greenwood using the Cortex system? Forgotten Realms meets Battlestar Galactica? Interesting none the less. PDF Format, Viable or Not? I got some excellent feedback to the question of pricing PDFs, both from the publisher and consumer sides. I understand the argument "that all PDFs should be free", even if I don't agree with it. Consumers have readily accepted digital media, whether music (both DRM and non-DRM), movies and even mainstream book publishing (Amazon Kindle, B&N Nook, numerous assorted e-book distributors and e-reader makers). Yes, our hobby is small. Yes, it may be nearly impossible to make a living off of it (especially after the D20 Implosion). That doesn't prevent one from making a profit off of it, large or small, if you are able to produce quality (and probably quantity too) products. I remember reading somewhere (at some time in the not too distant past) that a Role Playing Game PDF make 90% of its lifetime sales in its first 90 days or so. That means although it has a unlimited virtual shelf life, its visibility window is fairly small. How does one lengthen, or refresh, that window? Is PDF the ideal format for RPGs in electronic format? Is there a more viable or suitable format? Are there features that PDF is missing that you wish it had to increase it's viability or usefulness? Would a drop in e-book reader prices with suitable size screens lead to a higher amount PDF acceptance? What is Your PDF Price Point? I had this thought on my mind yesterday as I was driving to (and back) from Connecticut: what is the magic PDF price point? I'm not talking about absolute price, as in "I'd never pay more then $7.50 for a PDF book", I'm talking more on the order of "What percentage of the 'Dead Tree' version of the product's price are you willing to pay for an electronic / PDF version?" This is an important question. There are some folks out there that believe all PDF gaming material should be free, and it is certainly open to pirating (just like movies, music, and other electronic book formats). There are others that don't like PDFs at any price... I can understand that point of view. Then you have the other extreme: those of us that prefer the PDF format - even more so in my case as the iPad is an AMAZING PDF reader. I'm going to throw my own magic price point into the mix - somewhere in the 40% to 60% range of the printed product, although it is a rule I've managed to break more then once. 60% for the lower priced books, 40% for the higher end of the spectrum. If you read this blog on any sort of semi irregular basis, you know I'm keen on PDFs. I've always liked the format, or at least it's potential as a truly portable format that isnt stuck on your desktop or laptop screen. The Kindle DX was leaps and bounds closer to achieving that then we had ever been, and the iPad makes in a full blown reality. For me, PDFs are the key to my 21st century gaming library, tucked away on a portable device that takes up less space then the 1st Edition DMG. If you aren't as portable in your reading medium for PDFs, their value to you may be less. Then again, if you are far from a game store they may be more valuable then the physical book. Each situation is different. I like to find the really excellent gaming material that is made available for free from the companies themselves and share it with my readers. Not just because it is free, but because it meant to be read and used. In most cases, free PDFs from the named publishers are quality products aimed at showing your their works, in the hopes that you will buy further products from them, either hard copy or electronic. It is in their best interest to make it a quality experience. Not everything can be free. When I started gaming in 1981 or so, the only free gaming material is what you or your friends wrote up themselves. These days, with the OSR, retroclones, quickstarts and other stuff, I could probably game for years for free on stuff others wrote. Yet I'd be shutting myself out from 95% or the hobby. I'd never experience the Indy publishers, the ones that push our hobby to the edge and then some. Me, I enjoy my free and not-so-free PDFs. I find price to be less an issue then enjoyment. Still, it took me a while to prefer PDF to dead tree. Where do you stand? What is your price point? Alright, the new contest is going to be real easy. If you are already following Tenkar's Tavern via Google Friend's Connect, you are already entered. Giving away a PDF copy of FantasyCraft to a random Google Friend when we hit 40 followers. Giving away a PDF copy of Karma Roleplaying System Core to a random Google Friend when we hit 50 followers. Giving away a PDF copy of Fat Dragon's Dragonshire Deluxe to a random Google Friend when we hit 60 followers. The Banner Contest Has a Winner!